If you've somehow made your way over to TV Asylum just to peer at us from behind the glass like a zoo and observe us TV-obsessed folk in our natural habitat, this post might make you angry. Because I assume if you're the type of person who thinks TV is a waste of time and making us all dumber and whatnot, you're probably also the kind of person that is going to reject the comparison I'm about to make. TV shows have become functionally similar to books. There, I said it. Literature majors (if you're out there), take a moment to shake with rage, then come back. Or don't. Y'know, whatever. Go read a book. That's cool too. Anyway, the way I mean this is not in the fact that they are necessarily as educational or contain the same ability to make one more cultured by indulging in it, but in the way we now treat them in our culture. I say "now," because it wasn't always this way. But the dawn of recordable, replay-able TV series has introduced a culture shift. TV shows can be considered almost works of art, much like books, passed along from one person to another. They can develop a reputation--even become "classics" that everyone should see. 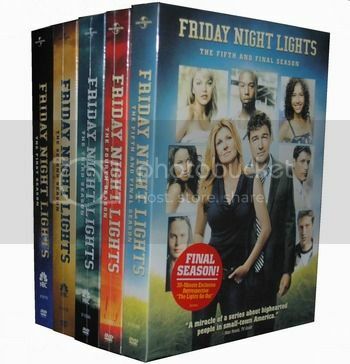 It's no longer "did you watch Friday Night Lights?" it's "have you watched Friday Night Lights?" And if the answer is "no," the response can (and will) be, "you HAVE to watch it." Much in the same way we would recommend a book: "have you read Catcher in the Rye? You have to read it." We've collected a proverbial library of TV shows via Netflix and DVD's. We have a plethora of TV shows that have already come and gone, yet we still have access to them. We can peruse the shelf and say, "Hm, everyone says Arrested Development was good. I think I'll give that a shot." TV shows that are currently on the air only make up a portion of what we are viewing as a culture. I just caught up on past seasons of Parks and Rec and am currently traveling through Friday Night Lights, and those shows have been our priorities all summer. Not So You Think You Can Dance? or…what else is on during the summer, again? It may be somewhat of a detriment to shows currently on the air, in that less shows will get attention simply because they are on TV, but I think this gives great shows much more longevity and challenges TV shows to be greater. I love this about TV. For one, I feel like it makes us more of a community. We're inviting people to watch shows we thought were amazing so that we can all be a part of the same group and talk about it. Maybe that's just the TVA inside of me talking, but I think it can apply outside of this safe-haven, too. What TV show do you consider a "classic" (regardless of its age)?